Blocknet provides a simple and powerful API to build previously impossible multi-chain applications that consume services on different blockchains, all while remaining 100% trustless and decentralized. The API is accessible through command line (cli) with additional endpoints on the way. Code examples can be viewed in the dark panels next to each respective API call. Please see Getting Started to begin using the APIs or continue reading below to learn more about the Blocknet Protocol, the different components, and how they all work. Blocknet is an interoperability protocol that can be used as a 2nd layer on any compatible blockchain to enable decentralized communication and exchange between different blockchains in a permissionless and trustless manner. Blockchain interoperability comes in 2 parts: exchange (XBridge) and communication (XRouter). 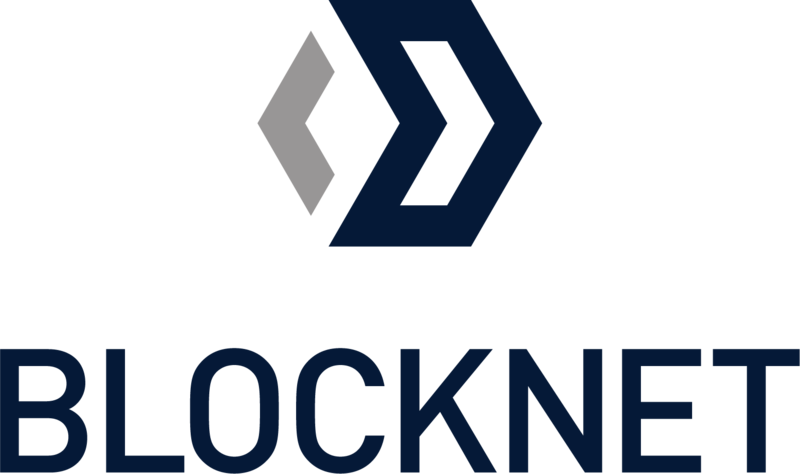 BLOCK is the utility token of the Blocknet blockchain and powers the Blocknet Protocol. BLOCK is used to pay fees for the network's services, such as those provided by XBridge and XRouter. Through these fees, BLOCK is also used for compensation to participating Service Nodes to incentivize support. The protocol is supported by a network of Service Nodes, which are similar to masternodes with an increased level of participation. Service Nodes host full nodes of the supported blockchains, host microservices, verify interactions between peers, route communication between blockchains, participate in governance by voting, and perform anti-spam and anti-DOS measures for the network. Service Node earn 100% of fees from XBridge, XRouter, and XCloud services. If you'd like to operate your own Service Node, see the Service Node Setup Guide. Storage of Funds - Trading occurs directly out of the client's wallet and funds are within the client's control throughout the entire process. Order Books - Orders are broadcasted directly peer-to-peer over the network. Each client compiles the order book themselves instead of relying on a central order book service. All integrators and services on the protocol share the orderbook and liquidity. Currently there is just support for a public order book, but there are plans for private order books and direct trading as well. Order Matching - This is performed peer-to-peer by the clients. Settlement - This is performed using BIP65 CLTV atomic swap contracts. For blockchains that do not inherently support BIP65, such as Ethereum, similar methods are being emulated to extend the protocol to those blockchains and subsequent assets. The exchange takes place on each respective blockchain with the process overlooked by a network of 400+ Service Nodes running full nodes of the compatible blockchains to ensure no malicious behavior is ocurring. Note that once an exchange is completed, when the funds are received will be dependent on the blockchain's accepted confirmation time. By default, the required amount of confirmations for most assets is 0 and the funds aren't spent until each blockchain achieves their respective required amount of confirmations. For instance, let's look at an example of an exchange between BTC requiring 1 confirmation and BLOCK requiring 2 confirmations. BLOCK has a faster confirmation time so it will receive 2 confirmations while BTC has 0, but the funds will not be spent until BLOCK has at least 2 confirmation and BTC has at least 1 confirmation. Both conditions must be met. This setting applies to the asset that you are receiving. The setting for the asset that is being sold is set by the opposite party. There is currently a fixed fee of 0.015 BLOCK to take (fill) an order and no fee to make(create) an order. The following diagrams depict the events of an exchange with various outcomes. As seen in the diagrams, a "client" refers to software utilizing the Blocknet Protocol, which can be a blockchain, microservice, dApp, mobile app, website, etc. The maker client creates an order locally. The order is put in new state. The order is broadcasted to the network. A network transaction fee for the maker asset's blockchain is charged to the maker. The Service Node network verifies the order is good. The order is added to the order books, which the Service Nodes sync. The order is put in open state. The taker client responds to take the order. A network transaction fee for the taker asset's blockchain is charged. A fixed 0.015 BLOCK fee is charged to the taker. The order is put in accepting state. The Service Node network verifies the response to take the order is good. The maker acknowledges the taker. The order is put in hold state. 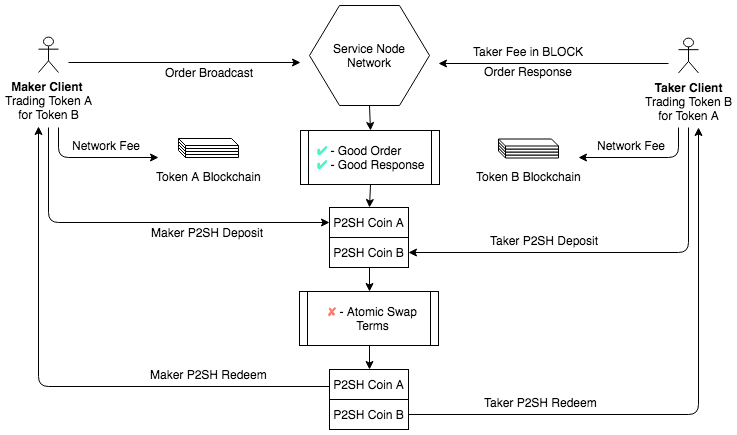 The maker and trader assets are deposited into the atomic swap P2SH address. The order is put in created state. The Service Nodes verify the terms of the atomic swap contract are good. 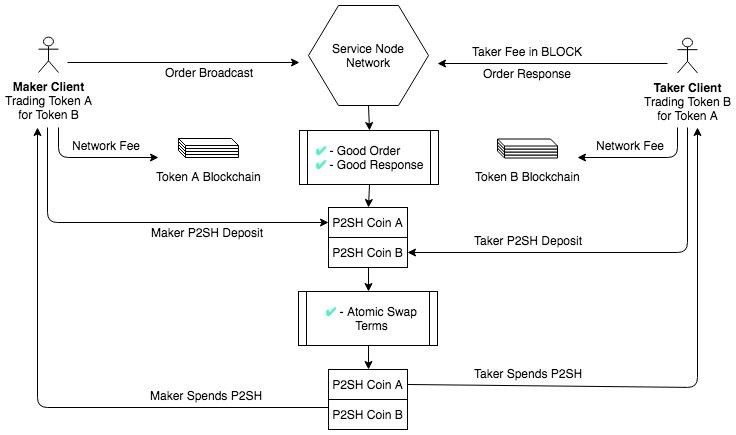 The transactions to the P2SH meet the required amount of confirmations. The P2SH secrets are spent to the opposite party. The order is put in signed state. The order is put in commited state. The maker and taker successfully receive the exchanged assets. The order is put in finished state. The Service Node network verifies the order is bad. The order is rejected by the network. The order is put in canceled state. The Service Node network verifies the response to take the order is bad. The Service Nodes verify the terms of the atomic swap contract are bad. The funds in the P2SH addresses are redeemed back to the original party. Maker Fee - When creating an order with XBridge, there is no fee other than the transaction fee for the network of the asset being sold. This is the same type of fee you would incur if sending this asset to another party. Having no fee to place an order encourages market makers to add liquidity. This also makes it possible to acquire the BLOCK needed to take orders. Taker Fee - When accepting an order with XBridge, a static fee of 0.015 BLOCK is charged at the time the order is taken. This fee is charged even if a trade is canceled or fails and is meant to discourage malicious behavior on the network. In addition to the 0.015 BLOCK fee, there is also the transaction fee for the network of the asset being sold. This is the same type of fee you would incur if sending this asset to another party. If the taker asset is BLOCK, there needs to be at least two UXTOs - one or more to cover the 0.015 BLOCK fee and one or more to cover the traded amount. In a future update, there will be a percent-based fee that’s charged when accepting an order, but the details of this are not yet finalized. Below is a non-exhaustive list of possible use cases that XBridge enables. Decentralized Exchange - A truly decentralized exchange can fairly easily be created utilizing XBridge since the protocol handles the order placement, order books, order matching, and settlement. A DEX dApp has already been developed call Block DX. The codebase is entirely open source under MIT license and can be used to create a white label DEX. Decentralized ShapeShift - The idea of a decentralized exchange can be abstracted to offer a simpler interface similar to ShapeShift where a user enter the amount they want to exchange and the best price is provided. OTC Trading - Due to the nature of XBridge, it can be used to exchange large amounts securely with the funds always remaining the user's control. XRouter provides the Blocknet Protocol with a communication layer consisting of an inter-blockchain SPV client backend, enabling the verification of blockchain records without requiring users to download the full blockchain. This empowers development of lightweight microservice architectures that harness contracts, protocols, and services from other blockchains, laying a foundation for a decentralized API ecosystem. Since XRouter functions on the TCP/IP level, it is compatible with any network. This includes public and private DLT's from Bitcoin, to IOTA, to Hyperledger. The XRouter system utilizes the Service Node network to route calls from the client directly to the respective blockchain. There are 2 types of XRouter calls: submissions and queries. XRouter submissions are calls that involve interactions with a blockchain, such as xrSendTransaction. With submissions, the packets are routed from the client to the respective blockchain and a response, if any, is routed back to the client. XRouter queries are calls requesting information from a blockchain, such as xrGetBlockCount. With queries, the packets are also routed from the client to the respective blockchain and the response of the information queried is routed back to the client. 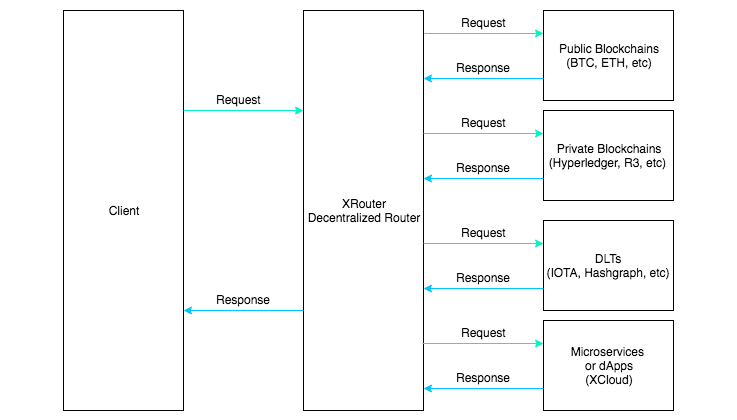 XRouter queries can require a specific amount of Service Nodes to receive a response from in order to achieve consensus on the final answer. The following diagrams depict the events of an XRouter query and submission. As seen in the diagrams, a "client" refers to software utilizing the Blocknet Protocol, which can be a blockchain, microservice, dApp, mobile app, website, etc. The client dispatches a packet for a query via API call to the Service Node network. The Service Nodes supporting the queried blockchain receive the packet. The Service Nodes route the packet of the query to the blockchain. The Service Nodes route the response from the blockchain back to the client. The client receives all responses, as well as a response for a majority consensus on the answer. The client dispatches a packet for a submission via API call to the Service Node network. The Service Nodes supporting the desired blockchain receive the packet. If there is a response from the blockchain, the Service Nodes route the response back to the client. XRouter SPV wallets utlize the xrs:: namespace while XCloud services utilize the xrs:: namespace. A list of the SPV wallets and services can be viewed using xrGetNetworkServices and you can pre-connect to the nodes with xrConnect. With XRouter, and subsequently XCloud, fees are determined by a free market. Service Nodes can specify the fee that they wish to charge for a call and client can specify the max fee they are willing to pay for calls. Clients keep a score of each Service Node. When a Service Node reaches a score of -200, the Service Node will be banned by the client for a 24hr period. After this 24hr period, the Service Node will start with a score of -25. The ban score threshold can be adjusted using the xrouterbanscore setting in blocknetdx.conf (see setup). This mechanism and values are subject to change in future releases. Join the Developer mailing list to stay updated. Supply Chain - In supply chain there will be multiple blockchains being used at various steps of the process much like there is today with traditional software stacks. The Blocknet Protocol and XRouter would allow information to be accessible between these different blockchains. For Example, pharmaceutical manufacturers have strict regulations to follow and need to provide certain information and assurances. Being able to access batch information from the raw materials being consumed, temperature and humidity information during transportation, and final destinations are all important. A smart contract utilizing XRouter to gather this information from each respective chain and write it to the pharmaceutical’s blockchain along with the batch code. XRouter would enable this communication to occur in a trustless way, which is important to ensure validity of the information. Storage and Hosting - If creating a dApp on Ethereum, you may require storage functionality. Ethereum doesn’t intrinsically handle file storage very efficiently. In this scenario, XRouter can be used to interact with other blockchains such as Storj, Filecoin, Sia, or Swarm to utilize their storage services. Media and Content - For content creation, a creator has the option of publishing to the LBRY Credits or Alexandria blockchains. Similar to HootSuite, which is a tool that allows posting to multiple social media platforms simultaneously, a dApp can be created using XRouter that offers the same benefit. The user can post their content once, whether it’s audio, video, literature, or art, and have it published to Alexandria’s and LBRY Credit’s blockchain platform simultaneously. Markets - There are many blockchains creating decentralized marketplaces including Origami, District0x, OpenBazaar, and Syscoin’s marketplace, but the offering of products are relatively low on each independent platform. A dApp that utilizes XRouter to aggregate all the products into a single hub would offer a lot more options to users and a fuller marketplace. It can also make publishing products easier by publishing to all platforms simultaneously through a single form, offering more exposure than posting to a single marketplace while saving time. Business and Industry - There are many dApps and blockchains that will end up using health data. Rather than submitting health data to each application, a universal EHR (Electronic Health Record) blockchain can be created to manage personal medical data and accessibility of data by each application. The health data on this EHR ledger can be shared amongst healthcare providers, hospitals, and insurance blockchains, dApps, and applications via XRouter. Certifications - Certifications and licensing records can be stored on a dedicated blockchain where they could be verified by a dApp built on the Blocknet Protocol. These records can be used to confirm qualifications and grant access or permissions. XCloud can be used to monetize any service with crypto payments without having to re-code or change anything about those existing applications. A good way to think of XCloud is like a decentralized AWS. CoinMarketCap could be connect in a matter of minutes and allow users to access their API for a fee paid in BLOCK, without requiring any signups or KYC. XCloud sits on top of, and is powered by, XRouter. Services are hosted by Service Nodes and operate in a similar manner as the full node SPV wallets. For further explanation, refer to XRouter Design, Namespacing, Fees, and XRouter Node Scoring. If you'd like to operate your own Service Node, see the Service Node Setup Guide. XCloud services utilize the xrs:: namespace. A list of the services can be viewed using xrGetNetworkServices. The Blocknet Protocol currently requires a synced Blocknet wallet, as well as the synced wallet of any blockchain that will be interacted with. In the future, with the use of XRouter, this will not be required. In addition, configuration files must also be composed. Download and install the latest Blocknet wallet. Open the wallet, encrypt it, and sync the blockchain. A bootstrap is also available for faster syncing. Compose blocknetdx.conf as seen in the sample. Set an RPC username and password in blocknetdx.conf. If using the XBridge API, see XBridge Setup. If using the XRouter API, see XRouter Setup. Compose xbridge.conf as seen in the sample (video tutorial). For automated setup, you can use the GUI configuration setup for Block DX (a DEX built on XBridge). This configuration file should be customized for whichever blockchains you will be interacting with. Here are configurations for other blockchains. Use the manifest to determine which files to use for with each blockchain and wallet version. See the full list of compatible blockchains and wallet versions. The BLOCK configurations will always be required since the Blocknet wallet is used to facilitate interactions. ExchangeWallets= under [Main] must also include each blockchain's symbol. Confirmations= is the number of confirmations required before funds are redeemable from the atomic swap contract. For blockchains like Bitcoin, it is recommended to use at least 1 confirmation. Compose the wallet configuration file for whichever blockchains will be interacted with (video tutorial). Here are configurations for other blockchains. Use the manifest to determine which files to use for with each blockchain and wallet version. This process is the same as for blocknetdx.conf. Only the blockchains that will be interacted with will require this configuration setup. Make sure funds are split into multiple UTXOs. If you have an order for 1 LTC and you only have a single 10 LTC input, all 10 LTC will be locked in this order. Having multiple, preferably smaller, UTXOs will allow a better distribution of funds across orders. Make sure funds are in legacy addresses (Eg. LTC funds should be in a "L" address). If any of the wallets are still open, they must be restarted in order to activate the new configurations. Open, sync, and unlock the Blocknet wallet, as well as whichever blockchains will be interacted with. Using the command line(cli), XBridge API calls can now be made. If also using the XRouter API, see XRouter Setup. If you would like to operate a Service Node and monetize any microservice, blockchain, API, or cloud tech on your own hardware, in many cases without having to write any code, see the Service Node Setup Guide. Add xrouter=1 to enables XRouter. A value of 0 means XRouter is disabled (default). Use xrouterbanscore to specify the score a Service Node must drop below before it is banned. The default value is -200. Service Nodes are banned for a 24hr period, after which they'll start with a score of -25. Compose xrouter.conf as seen in the sample. All settings are optional. timeout - Defines how long (in seconds) your client waits for a response from a Service Node. 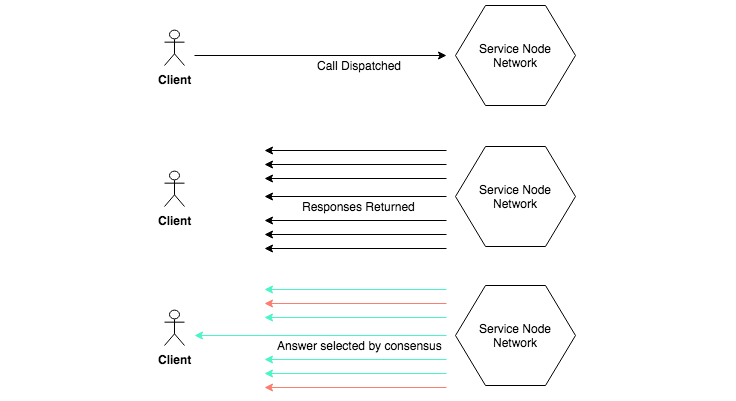 The default value is 30.
consensus - The number of Service Nodes that are used to route calls and use the majority response from for consensus. This can be overridden when making calls via the node_count parameter. The default value is 1.
maxfee - The maximum fee you are willing to pay for calls. Service Nodes with fees higher than your specified max fee will not be queried. The default value is 0 (i.e. free calls only). For now, all fees are paid in BLOCK. Values set under [Main] override the default values and become the new default settings for all subsections that don't have the respective setting specified. Subsection settings override [Main] and default settings. Blockchain-specific subsections have the highest priority and override all other settings. The setting hierarchy from highiest priority to lowest priority is as follows: [BTC::xrGetBlockCount] > [BTC] > [xrGetBlockCount] > [Main] > default. The higher priority settings override the lower priority settings. Use xrReloadConfigs to apply changes to xrouter.conf without needing to restart the client. Using the command line(cli), XRouter API calls can now be made. To begin you can use xrGetNetworkServices to view the supported SPV wallets (designated by the xr:: namespace). To use services (designated by the xrs:: namespace), see XCloud Setup. If also using the XBridge API, see XBridge Setup. Setup XRouter. This is required since XCloud is built on top of XRouter. In xrouter.conf, add settings for the services you would like to use. The subsection heading used the service name with the namespace as it's shown in the services array in the xrGetNetworkServices response. All settings are optional. Values set under [Main] override the default values and become the new default settings for all subsections that don't have the respective setting specified. Service settings override [Main] and default settings. The setting hierarchy from highiest priority to lowest priority is as follows: [xrs::ServiceName] > [Main] > default. The higher priority settings override the lower priority settings. Using the command line(cli) or console, XCloud API calls can now be made. To begin, use xrGetNetworkServices to view the calls under services and use xrService or xrServiceConsensus to make the call. The following set of calls are used to conduct decentralized and trustless exchanges over the Blocknet network. See XBridge Setup for instructions on setting up your environment for use with XBridge. This call is used to create a new order. Only assets returned in dxGetLocalTokens can used for the maker and taker asset. If an asset is not showing, it has not been properly configured (refer back to #2 in XBridge Setup. Use dxGetNetworkTokens to view all the assets currently supported on the network. There are no fees to make orders, but there are transaction fees for the maker asset's native network. maker string Maker trading asset; the ticker of the asset being sold by the maker. maker_size string(float) Maker trading size. String is used to preserve precision. maker_address string Maker address for sending the outgoing asset. taker string Taker trading asset; the ticker of the asset being sold by the taker. taker_size string(float) Taker trading size. String is used to preserve precision. taker_address string Maker address for receiving the incoming asset. type string This is the order type. exact: Matches a specific order. dryrun: Receive a response without actually submitting the order to the network. id string The order UUID. updated_at string ISO 8601 datetime, with microseconds, of the last time the order was updated. created_at string ISO 8601 datetime, with microseconds, of when the order was created. block_id string The UUID block hash of the current block on the Blocknet blockchain at the time the order was created. This call is used to take an order. Taking your own order is currently not supported. Only assets returned in dxGetLocalTokens can used for the maker and taker asset. If an asset is not showing, it has not been properly configured (refer back to #2 in XBridge Setup. Use dxGetNetworkTokens to view all the assets currently supported on the network. Taking an order has a 0.015 BLOCK fee. There are also transaction fees for the taker asset's native network. If the taker asset is BLOCK, there needs to be at least two UXTOs - one or more to cover the 0.015 BLOCK fee and one or more to cover the traded amount. id string ID of order being filled. send_address string Taker address for sending the outgoing asset. receive_address string Taker address for receiving the incoming asset. This call is used to cancel one of your own orders, which automatically rolls back the order if a trade is in process. id string ID of order being cancelled. maker string Sending asset of party cancelling the order. maker_size string(float) Sending trading size. String is used to preserve precision. maker_address string Address for sending the outgoing asset. taker string Receiving asset of party cancelling the order. taker_size string(float) Receiving trading size. String is used to preserve precision. taker_address string Address for receiving the incoming asset. This call is used to retrieve order info. id string ID of order of interest. This call is used to retrieve all orders of every market pair. It will only return orders for assets returned in dxGetLocalTokens. This call does not take parameters. Array array An array of all orders with each order having the following parameters. This call is used to retrieve all of your orders (of all states) from the local client. It will only return orders from your current session. This call is used to retrieve all recent filled orders by a given trade pair. It will only return orders that have been filled in your current session. combines boolean (Optional Parameter) Defaults to true. true: Receive filled orders for both the maker and taker assets as specified, as well as the inverse with the maker asset as the taker and the taker asset as the maker. false: Receive filled orders only with the maker and taker assets as specified. Array array Array of orders sorted by date descending (most recent filled trade first). time string Time the order was filled. This call is used to retrieve the OHLCV data by a trade pair within a specified time range. It can return the history for any compatible asset since all trade history is stored on-chain. start_time int Start time(Unix time) representing the lower boundary to search. end_time int End time(Unix time) representing the upper boundary to search. order_ids bool (Optional Parameter) Defaults to false. true: Receive the GUIDs of all filled orders in each slice. false: Do not receive the order GUIDs. with_inverse bool (Optional Parameter) Defaults to false. false: Returns the orders in the specified market pair. true: Returns the orders in the inverse pair too, e.g. LTC SYS -> SYS LTC would be returned as well. limit int (Optional Parameter) Defaults to 2147483647. The max number of interval slices returned. time string ISO 8601 datetime, with microseconds, of the time at the beginning of the time slice. low float64 Exchange rate lower bound within the time slice. high float64 Exchange rate upper bound within the time slice. open float64 Exchange rate of first filled order at the beginning of the time slice. close float64 Exchange rate of last filled order at the end of the time slice. volume int64 Total volume of the taker asset within the time slice. order_ids array Array of GUIDs of all filled orders within the time slice. This call is used to retrieve all the assets supported by the local client. If an asset is not showing, it has not been properly configured (refer back to #2 in XBridge Setup. Array array An array of all the assets supported by the local client. This call is used to retrieve all the assets currently supported by the network. This list may differ from the compatibility list due to assets being unofficially supported or assets not being supported by any nodes on the network. Array array An array of all the assets supported by the network. This call is used to retrieve the asset available balances for all connected wallets on the local client. This will only return balances for the assets returned in dxGetLocalTokens. If an asset is not showing and is not returned in or the value is showing 0, it has not been properly configured (refer back to #2 in XBridge Setup. Object object Key-value object of the assets and respective balances. -- key string The asset symbol. -- value string(float) The available wallet balance amount. String is used to preserve precision. Detail 1 - Retrieves the best bid and ask. Detail 2 - Retrieves a list of aggregated orders. This is useful for charting. Detail 3 - Retrieves a list of non-aggregated orders. This is useful for bot trading. Detail 4 - Retrieves the best bid and ask with the order GUIDs. It will only return orders for assets returned in dxGetLocalTokens. max_orders int (Optional Parameter) Defaults to 50. The maximum total orders to display for bids and asks combined. Odd values are rounded up 1. Quantity is split evenly between bids and asks. Retrieves the best bid and ask. bids array An array of the best bids. - price string(float) The highest bid price for the asset. String is used to preserve precision. - size string(float) The size of bid orders at this price. String is used to preserve precision. - quantity int The total bid orders at this price. asks array An array of the best asks. - price string(float) The lowest ask price for the asset. String is used to preserve precision. - size string(float) The size of ask orders at this price. String is used to preserve precision. - quantity int The total ask orders at this price. Retrieves a list of aggregated orders. This is useful for charting. bids array An array of bids. - price string(float) The bid price for the asset. String is used to preserve precision. asks array An array of asks. - price string(float) The ask price for the asset. String is used to preserve precision. Retrieves a list of non-aggregated orders. This is useful for bot trading. - size string(float) The size of the bid order. String is used to preserve precision. - order_id string The UUID of the bid order. - size string(float) The size of the ask order. String is used to preserve precision. - order_id string The UUID of the ask order. Retrieves the best bid and ask with the order GUIDs. - order_ids array An array of UUID for bid orders at this price. - order_ids array An array of UUID for ask orders at this price. This call is used to reload xbridge.conf to run newly configured settings without needing to restart the Blocknet client. bool true: Successfully reloaded file. The following set of calls are used to communicate and interact with blockchains remotely over the Blocknet network via XRouter. See XRouter Setup for instructions on setting up your environment for use with XRouter. This call is used to view the XRouter services currently supported on the network, along with the number of nodes supporting each service. XRouter SPV calls use the xr:: namespace. XCloud services use the xrs:: namespace and can be called using xrService and xrServiceConsensus. reply object An object containing information on supported services. spvwallets array An array of supported SPV wallets, represented by the asset's ticker. services array An array of supported XCloud services. nodecounts object An object of supported SPV wallets and XCloud services with how many nodes support each. -- key string The SPV wallet or XCloud service with it's namespace. -- value int The amount of nodes supporting each respective service. uuid string The response ID, which can be used to view this response again with xrGetReply. This call is used to connect to XRouter nodes with the specified service and download their configs. This command is useful to determine how much nodes are charging for services. It's also useful to "warm up" connections. By connecting to nodes immediately before making a large request it can speed up the reponse time (since those connections will be open). However, XRouter nodes close inactive connections after 15 seconds, so keep that in mind. After connecting, call xrConnectedNodes to display information about these XRouter nodes. service string Service name including the namespace (xr::[spv_call] or xrs::[xcloud_service]). Defaults to 1 if no consensus= setting in xrouter.conf. The number of nodes to pre-connect to that will be used to route calls and use the majority response from for consensus. reply array An array of nodes providing the specified service, along with their configs. nodepubkey string The node ID. score int The node's score based on quality of service. A score of -200 will ban the node for a 24hr period. You can change the ban threshold with the xrouterbanscore setting in blocknetdx.conf. See node scoring for more details. banned bool Signifies if the node is currently banned. false: Node is not banned. See node scoring for more details. paymentaddress string The node's payment address. spvconfigs array An array of each SPV wallets and command configurations. spvwallet string The SPV wallet that the configurations under commands pertains to. commands array An array of each SPV wallet command and respective configurations. command string The SPV command. fee float The command fee, overrides the feedefault and fees values. This priority has already been accounted for in this value. requestlimit int The minimum time allowed between calls in milliseconds. A value of -1 means there is no limit. If you exceed this value you will be penalized and eventually banned by this specific node. paymentaddress string The node's payment address for this specific command. disabled bool Signifies if the node has disabled this command. true: Call is disabled and not supported. false: Call is enabled and supported. feedefault float The node's default service fee. This fee is overridden by the values specified in fees, SPV command configuration fee, and XCloud service command configuration fee. fees object Object of SPV commands and respective fees. These values are overridden by the SPV wallet-specific configuration fee. services object Object of the node's XCloud service calls with respective properties. parameters string Information on the parameters the command takes. fee float The service command fee. This overrides the feedefault value. fetchlimit int The maximum number of blocks processed. A value of -1 means there is no limit. A value of 0 means no blocks will be processed. timeout int The value for timeout you set in xrouter.conf for this call. Defines how long (in seconds) your client waits for a response from a Service Node. The default value is 30. This call is used to lists all the data about current and previously connected nodes. This information includes supported SPV wallets, SPV calls, services, fees, and other service settings. reply array An array of nodes providing the specified service. fee float The SPV command fee. This overrides the feedefault and fees values. This call is used to retrieve the current block height of the longest chain for the specified blockchain. It requires the blockchain to be SPV wallet supported. blockchain string The blockchain, represented by the asset's ticker (BTC, LTC, SYS, etc.). The number of nodes that will be used to route calls and use the majority response from for consensus. reply int The latest block number of the specified blockchain. If using a node_count greater than 1, this returns the most common reply within allreplies. If there is a tie then one is chosen, or if one is an error then the non-error is chosen. allreplies* array An array of objects with responses from each node. This can be useful if you wanted to do your own analysis/filtering of the responses. nodepubkey* string The node ID. score* int The respective node's score based on quality of service. A score of -200 will ban the node for a 24hr period. You can change the ban threshold with the xrouterbanscore setting in blocknetdx.conf. See node scoring for more details. reply* int The latest block number of the specified blockchain from the respective node. * This is only returned if using a node_count greater than 1. This call is used to retrieve the block hash of the specified block and blockchain. block_number string The block number or hex for the block hash of interest. reply string The block hash of the specified block and blockchain. If using a node_count greater than 1, this returns the most common reply within allreplies. If there is a tie then one is chosen, or if one is an error then the non-error is chosen. reply* string The block hash of the specified block and blockchain from the respective node. This call is used to retrieve the block data for the specified block hash and blockchain. block_hash string The block hash for the block of interest. reply object An object containing the block data for the specified block hash and blockchain. If using a node_count greater than 1, this returns the most common reply within allreplies. If there is a tie then one is chosen, or if one is an error then the non-error is chosen. reply* object An object containing the block data for the specified block hash and blockchain from the respective node. This call is used to retrieve block data for multiple block hashes on the specified blockchain. Currently the maximum request is 50 blocks, although a node may set this limit to less. block_hashN string The block hashes for the blocks of interest. The hashes must be separated by a comma with no spaces. reply array An array containing objects with the block data for each the request block on the specified blockchain. If using a node_count greater than 1, this returns the most common reply within allreplies. If there is a tie then one is chosen, or if one is an error then the non-error is chosen. reply* array An array containing objects with the block data for each the request block on the specified blockchain from the respective node. This call is used to decode a specified bockchain transaction HEX. It requires the blockchain to be SPV wallet supported. tx_hex string The raw transaction HEX to decode. reply object An object containing the decoded transaction data. If using a node_count greater than 1, this returns the most common reply within allreplies. If there is a tie then one is chosen, or if one is an error then the non-error is chosen. reply* object An object containing the decoded transaction data from the respective node. This call is used to retrieve the transaction data for the specified transaction ID (hash) and blockchain. txid string The transaction ID(hash) for the transaction of interest. reply object An object containing the transaction data for the specified transaction ID and blockchain. If using a node_count greater than 1, this returns the most common reply within allreplies. If there is a tie then one is chosen, or if one is an error then the non-error is chosen. reply* object An object containing the transaction data for the specified transaction ID and blockchain from the respective node. This call is used to retrieve transaction data for multiple transaction IDs (hashes) on the specified blockchain. Currently the maximum request is 50 transactions, although a node may set this limit to less. txidN string The transaction ID (hash) for the transactions of interest. The hashes must be separated by a comma with no spaces. reply array An array containing objects with the transaction data for each requested transaction on the specified blockchain. If using a node_count greater than 1, this returns the most common reply within allreplies. If there is a tie then one is chosen, or if one is an error then the non-error is chosen. reply* array An array containing objects with the transaction data for each requested transaction on the specified blockchain from the respective node. This call is used to submit a locally signed transaction on the specified blockchain. signed_tx string The signed transaction HEX. reply object The transaction hash of the sent transaction. This call is used to look up responses from previous XRouter calls without having to request them from the network. There are no fees for this call. uuid string The UUID of the response you want to look up. reply array The response for the previous call associated with the UUID. This call is used to show the configurations received from all nodes as raw text. Array array An array of objects containing the configurations for each node you are connected to. config string The raw text contents of xrouter.conf. This call is used to request the latest configuration files from all Service Nodes. Signifies whether to force update regardless of rate limit checks. true: Force update if rate limit exceeded. false: Only update if within rate limit. "reply" : "Config requests have been sent"
reply string A confirmation that the new configs have been requested. This call is used to reload xrouter.conf and all associated plugin configs after changes have been made to apply newly configured settings without needing to restart the Blocknet client. reply string A confirmation that xrouter.conf has been reloaded. This call is used to print your XRouter configuration. nodepubkey* string Your node ID. score* int Not applicable when viewing your own score. paymentaddress* string Your node's general payment address. spvwallets* array An array of SPV wallets you're supporting, represented by the asset's ticker. spvconfigs* array An array of each SPV wallets and command configurations. spvwallet* string The SPV wallet that the configurations under commands pertains to. commands* array An array of each SPV wallet command and respective configurations. command* string The SPV command. fee* float The command fee, overrides the feedefault and fees values. This priority has already been accounted for in this value. requestlimit* int The minimum time allowed between calls in milliseconds. A value of -1 means there is no limit. If a client exceeds this value they will be penalized and eventually banned by your node. paymentaddress* string Your node's payment address for this specific command. disabled* bool Signifies if your node has disabled this command. feedefault* float Your node's default service fee. This fee is overridden by the values specified in fees, SPV command configuration fee, and XCloud service command configuration fee. fees* object Object of SPV commands and respective fees. These values are overridden by the SPV wallet-specific configuration fee. services* object Object of your node's XCloud service calls with respective properties. parameters* string Information on the parameters the command takes. fee* float The service command fee. This overrides the feedefault value. fetchlimit* int The maximum number of blocks processed. A value of -1 means there is no limit. A value of 0 means no blocks will be processed. timeout* int The value for timeout you set in xrouter.conf for this call. Defines how long (in seconds) your client waits for a response from another Service Node. The default value is 30.
disabled* bool Signifies if your node has disabled this service. xrouter bool Signifies XRouter activation. servicenode bool Signifies if your client is a Service Node. true: Client is a Service Node. false: Client is not a Service Node. config string The raw text contents of your xrouter.conf. plugins* object An object of each service you have setup and the raw text contents of the respective config file in teh plugins folder within the Blocknet data directory. * This is only returned if your client is a Service Node. The following set of calls are used to communicate and interact with XCloud services remotely over the Blocknet network via XRouter. XCloud consists of services that are powered by XRouter and are therefore interacted with using a subset of commands from the XRouter API. See XCloud Setup for instructions on setting up your environment for use with XCloud. This call is used to send a request to an XCloud service. XCloud is a decentralized microservice cloud network powered by XRouter that allows for interaction with microservices, blockchains, APIs, and cloud tech that's hosted by Service Nodes. If you'd like to operate your own Service Node, see the Service Node Setup Guide. service string The service name without the namespace (xcloud_service, not xrs::[xcloud_service]). Refer to service documentation for parameter requirements. Information about an XCloud service can be viewed in the service configuration. Use xrConnect to find a node with the service, then use xrConnectedNodes to review the service information. reply unknown The service's response data. error object The native error response if an error occurred, otherwise a successful response will contain a null error. This call is used to send a request to an XCloud service, along with a specified amount of nodes for consensus. XCloud is a decentralized microservice cloud network powered by XRouter that allows for interaction with microservices, blockchains, APIs, and cloud tech that's hosted by Service Nodes. If you'd like to operate your own Service Node, see the Service Node Setup Guide. node_count int The number of nodes that will be used to route calls and use the majority response from for consensus. reply unknown The service's response data. If using a node_count greater than 1, this returns the most common reply within allreplies. If there is a tie then one is chosen, or if one is an error then the non-error is chosen. reply* array The service's response data from the respective node. This API documentation will be continuously updated to improve descriptions, instructions, and overall clarity on how to use the API and begin building on the Blocknet Protocol. An overview of changes can be viewed below. To receive notifications and stay informed on important developer updates and changes relating to the Blocknet Protocol, subscribe to the developer notification emailing list.